*Cinematic Single Player Campaign* - Go deep behind enemy lines as an elite Black Ops soldier where if you are caught, captured or killed, your country will disavow all knowledge of your existence. *ZOMBIES! * - For the first time on the Mac, fight to survive in a relentless zombie onslaught, solo or with a friend. *Enhanced Multiplayer* - New perks and killstreaks, deeper levels of character and weapon customization, and all new game modes. 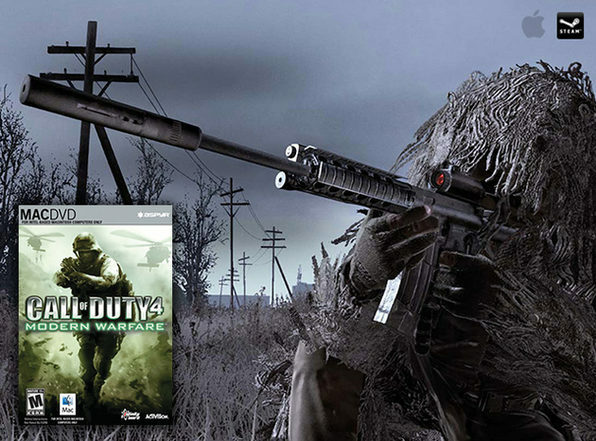 We do not recommend that you play Call of Duty: Black Ops on any of the following unsupported graphic chipsets: HD3000 (2011 Mac Mini, 2011 MacBook Air, 2011 13” MacBook Pro), HD4000 (2012 13” MacBook Pro), ATI Radeon HD 2000 series, HD 4670, HD6630M, NVIDIA 8000 & 9000 series, GT100 series, 320M, 330M, Intel Integrated GMA950, x3100. Internet connection required for Multiplayer and Zombies. This game is not supported on volumes formatted as Mac OS Extended. For you gamers out there that aren't looking to spend an arm and a leg for COD: Ghosts you can now experience this award-winning title for pennies on the dollar. Fighting as both a U.S Marine and British S.A.S. soldier, you will utilize sophisticated technology and weaponry to take control of the battlefield and to lead your squad to victory. 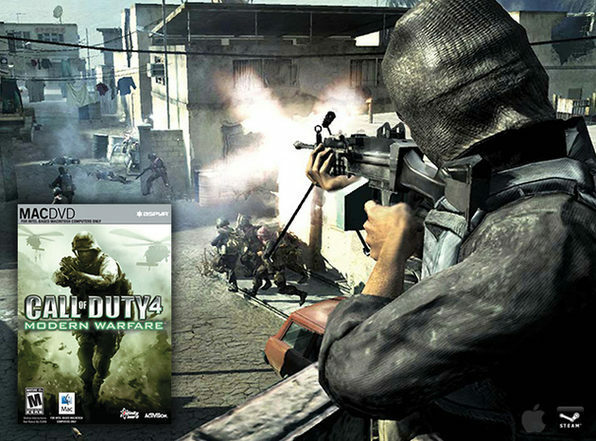 Get hours of action packed, gun wielding fun with one of the best FPS franchises out there. In our minds, you can't go wrong with an epic single player storyline and classic multiplayer gameplay that lets you immerse yourself in dynamic battle scenes so you can fight your way out. Unparalleled Multiplayer Depth – Featuring a robust leveling system, a variety of unlockable perks, the ability to join a live match, as well as create a class and party capabilities. Multiplayer Requirements: Internet (TCP/IP) or LAN (TCP/IP) play supported. Internet play requires broadband connection. *All New Enhancements* – Stunningly realistic graphics, seamless gameplay, groundbreaking AI, and choice-based gameplay innovations make this one of the most intense WWII shooters ever. *Bigger, Better, Braver* – Huge scale battles with more tanks, troops, and explosions on-screen. *Historical Battle Sites* - Venture across a wide range of locales and environments across the European Theater. Fight "The Desert Fox" across the scorching sands of North Africa, storm and scale the cliffs of Pointe du Hoc against a relentless German counterassault, and slog through urban chaos as a tank hunter in war-torn Russia. *Fully Aware AI* - You're not alone on the battlefield, your comrades now adapt to changing situations around them, and communicate accordingly using a context-sensitive battle chatter system. Incoming enemies? They'll let you know. *Strategic Battle Tactics* - Wage war on your terms by completing missions in the order you see fit, use custom tactics to gain advantage in open-ended battlefields. *Multiplayer Mayhem* – Jump online for intense Axis vs. Allies team-based multiplayer action. Languages: English, French, German, Italian, Spanish (Interface). *Hangar 18* - Fight through this highly classified military base filled with experimental weapons labs, the SR-71 Blackbird test hangar, and a mysterious autopsy room. *Drive-In* - Modeled after a 1960's-era American Drive-In theater, you'll get up close and personal with your adversaries in close quarters combat. *Silo* - Infiltrate a massive Soviet nuclear missile site under construction in this multilevel battleground. *Hazard* - Mind your manners on this coastal Cuban golf course, where stocked clubhouses and manicured fairways meet snipers hidden in sand traps. *Hotel* - Bloodshed with a view. Battle it out on the roof of a luxury hotel and casino above old Havana. *Convoy* - Watch your back, you're on the scene of an ambushed US military convoy. Intense, close-quarters combat will ensue. *Zoo* - Prepare for the ride of your life as you fight through an abandoned Soviet Russian Zoo with danger at every turn. *Stockpile* - In a remote Russian farm town housing secret WMD facilities, use your stealth to eliminate your enemies. *Call of the Dead* - Undead on ice! Take your four member, zombie-killing dream-team to a desolate Siberian island to survive against hordes of hungry Russian zombies - but watch out for the menacing super zombie. *Shangri-La* - Deep in the heart of an exotic jungle lies a mythical shrine rife with the undead. Navigate through deadly traps and the shifting walls of this zombie infested temple, but watch your step - danger lurks within the labyrinth of underground caverns. Prepare yourself for an *out of this world Zombie experience* in this expansion pack for Call Of Duty: Black Ops. Explore the all-new Moon level, where *armed with a space-age arsenal of weapons*, you must fight back *waves of undead astronauts* and adapt to fluctuating gravity as you unearth conspiracies dating back to World War II. Just remember, *in space no one can hear you scream*. Also included in the Rezurrection pack are *four re-mastered levels of COD zombie lore*: Nacht der Untoten, Verruckt, Shi No Numa and Der Riese, the Zombie factory that started it all. And slay to the beat with an *enhanced zombies soundtrack* including three tracks never before available for purchase. All games are instantly redeemable through Steam upon purchase. Call of Duty: Black Ops and its 2 content packs are Mac only, while Call of Duty 2 and Call of Duty 4 are both SteamPlay. These games are completely downloadable upon purchase . All games are instantly redeemable through Steam upon purchase. Upon purchase you must follow the redemption instructions located in your account to activate your games.